The Rose Legacy was formed in early 1997 for the purpose of creating Remembrance Videos for dying individuals and those who would like to be remembered after their death in a special way. The Rose Legacy then became aware of the Ricky Browning, an 11 year old fighting an inoperable brain tumor. Ricky pretended that Godzilla, his life long hero, was in his head fighting off the brain tumor. Ricky went through four months of extensive chemotherapy at Scottish Rite Children's Medical Center and radiation treatment at Piedmont Hospital, both in Atlanta. Ricky was even treated by the Atlanta Children's Hospice for his cancer. With a positive mental attitude, a new treatment protocol by the National Childhood Cancer Foundation, and an incredible will to live, Ricky's visualization technique helped him survive his illness longer than ever thought possible. Ricky passed away on August 26, 1998, but his memory lives on in all that were touched by his spirit and courage. Ricky's love for Godzilla attracted the attention of Guitar Impresario Donald "Buck Dharma" Roeser of the band Blue Öyster Cult. Mr. Roeser penned the hit song "Godzilla" which has sold millions of copies worldwide. Roeser agreed to perform a fund raising concert on April 11, 1997 for Ricky and his family just because Ricky loved Godzilla. 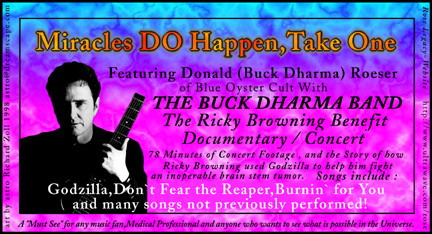 He formed "The Buck Dharma Band" specifically for Ricky's concert. The Buck Dharma Band appeared on Fox5 and Channel 46 news stations in Atlanta and two radio stations. The Concert, held April 11, 1997, was professionally recorded and filmed by volunteers and the video is available through The Rose Legacy.